Choosing the Top-Ranked Unique Savable Structures for this year has been harder than ever. In addition to those bridges facing demolition and replacement with UCEBs -- some things never change -- this year's nominations also focused on abandoned bridges that are intact but could soon collapse or deteriorate beyond the point of repair. 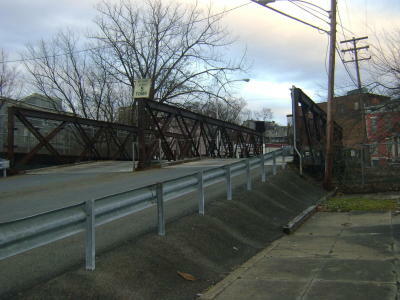 The bridge: Despite having the appearance of a cantilever, this unique bridge has been classified as a "Reverse Parker", or a Parker truss where the top chord swoops downward instead of up. Built in 1905 by the Kansas City Bridge Co., it's unclear why this peculiar design was chosen, especially with a relatively short main span (120 feet) which could have easily accommodated a simple Pratt truss. The significance: This is the only known bridge of its type in the U.S., making this a no-brainer for listing in the National Register of Historic Places in 1990. The situation: The Asylum Bridge has remained abandoned for some years. Photos suggest that the stone piers are deteriorating, which could jeopardize the bridge. 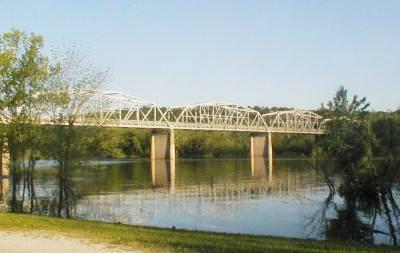 The plan: Miami County has an excellent collection of historic bridges, especially around Osawatomie. 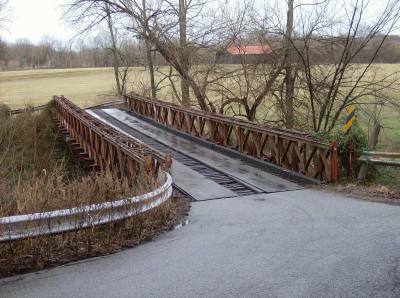 Last year, the nearby Creamery Bridge was rehabilitated, and comments in the newspaper suggest that the county commissioners understand the value of historic bridges. If the Asylum Bridge were to be repaired and reopened to pedestrians, Miami County will be sitting pretty. The bridge: Built for the Chicago Burlington & Quincy Railroad in 1894, this bridge features three pin-connected Pratt through trusses. 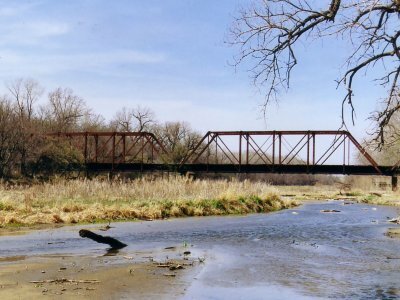 Despite its location near the more famous Republican River Pegram Truss, this bridge has remained overlooked. The significance: This is one of a tiny population of truss bridges attributed to the Lassig Bridge & Iron Works of Chicago. 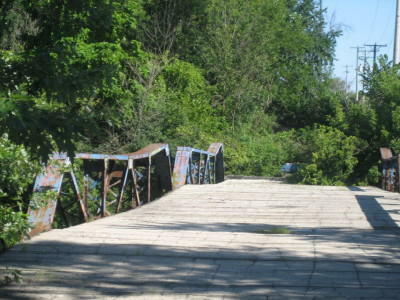 The situation: Although the bridge appears structurally sound, it is abandoned and overgrown. 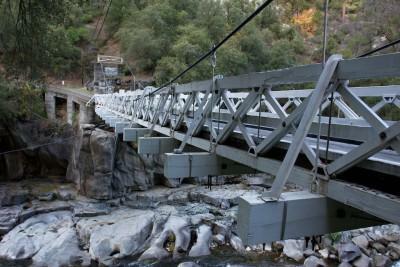 Similar bridges have been dismantled in the past for scrap value with little or no warning. The plan: Designed to support locomotives, the superstructure on this bridge is likely sound enough to handle pedestrians. With a new deck and railings, this bridge could be reopened for pedestrian use, making it a perfect companion for the nearby Pegram Truss bridge. The bridge: Nicknamed the "Blue Bridge", this was built as a four-span Warren pony truss, but one of the spans has collapsed and the other three are in appalling condition due to deterioration and visits from metal thieves. The significance: This is a rare example of a multi-span pony truss bridge of any kind in the Chicago area. 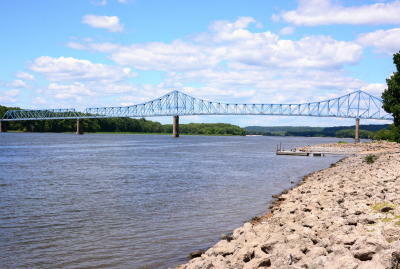 The situation: It seems likely that the remaining spans will eventually collapse under their own weight without repairs. The plan: A report from 2012, the Blue Island Active Transportation Plan, advocates the possibility (p. 33) of restoring the bridge for bicycle/pedestrian access to Jackson Street on the south side. It notes, "Jackson Street is closed westbound at Ashland Avenue, yet Calumet Township continues to collect tax for its maintenance. The township can return value to Blue Island residents by paying for reopening of Jackson Street as a nonmotorized route and participating in the reconstruction of the Blue Bridge as a bicycle and pedestrian crossing." The bridge: Located at a scenic stretch of the South Fork American River, this one-lane suspension bridge was built in 1939. The significance: Featuring timber floor beams, stringers, and deck, this bridge more closely resembles a rustic 1800s-era bridge than something from the 1930s. The situation: Sitting in the middle of a sharp S-curve and having a deck width of only 9 feet, local officials have wanted to replace the bridge for many years. According to the official project website, however, no decision has been made. The plan: Mosquito Road near the bridge features sharp switchbacks, so it seems likely that a replacement bridge would be built at a high level over the canyon to eliminate these curves. If indeed the new bridge is built on a different alignment, it should be feasible to keep the old bridge in place for pedestrian use (or even light traffic) to enjoy this scenic location. The bridge: This is a large cantilever through truss over the Mississippi River featuring a partial K-truss design. It was opened to traffic on the last day of 1932. The significance: Cantilevered trusses as well as K-trusses are both rapidly disappearing. The situation: Construction on a replacement bridge is slated to begin 2015. The Illinois Department of Transportation offered the old bridge for adaptive reuse, but with ridiculous strings attached -- it must be completely removed within 30 days and then reassembled and maintained forever. Such a short time frame to carefully dismantle this massive bridge is virtually impossible, and would represent a truly remarkable feat in the history of civil engineering. The plan: This bridge received the most nominations of any other bridge, but it's going to require a very well-organized campaign to have any hope of saving this one. The bridge: Built in 1892 by D.H. Young of Manchester, Iowa, this Pratt through truss features elaborate decorations above the portals. 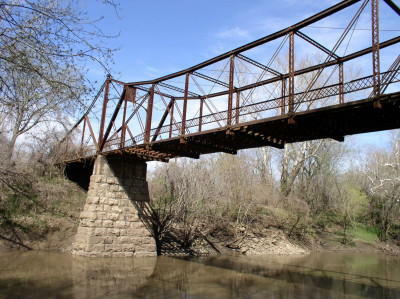 The significance: The Iowa Historic Bridge Inventory reports that this NRHP-listed bridge is distinguished "for its relatively early erection date, well-preserved condition and the decorative iron cresting on its portals." This is a rare remaining work of D.H. Young, a civil engineer and bridge builder who later became a state representative and senator. The situation: The bridge was closed to traffic in March 2013 after failing an inspection due to "corrosion of bridge materials." Plans are underway to replace the bridge. The plan: Sitting next to a city park, it makes sense to build a replacement bridge on a new alignment and leave the historic bridge in place for pedestrian use. The bridge: This is an authentic 90-ft Bailey truss relocated from an unknown location, perhaps in 1982, and set on existing stone piers. The significance: Although the exact history of this span remains a mystery, the bridge is marked with the names of two British companies: Thos. Storey Engineers Ltd of Manchester (shown by patent plaque) and Appleby-Frodingham Steel Co. of Lincolnshire (steel brand). This strongly implies that the structure was imported from England as World War II era surplus. The British plaques make this an exceptionally rare bridge. The situation: The bridge is closed to all traffic with a barricade at one end and a chain-link fence at the other. The plan: Bailey bridges were intended to be portable, and that feature would come in handy if a new home can be found for this structure. 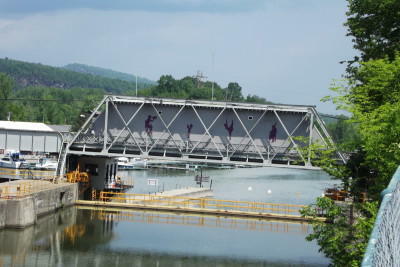 The bridge: This bridge spans Lock 12 of the Champlain Canal at Whitehall, New York. It is a double-intersection Warren through truss built in 1911. The significance: Although historic in its own right, this bridge is also notable for how it was used in modern times: as a performing arts center. When the bridge was closed to traffic in 1999, civic leaders spearheaded the ingenious idea of converting it into a theater. An enclosure was built inside the trusses, providing seating capacity for 60 people. This unique venue operated until 2009, when the bridge failed inspection and was completely shut down. The situation: The theater enclosure has been removed and the bridge is in danger of demolition. The plan: It may take another ingenious idea, but hopefully this bridge can be preserved in place. It would be a shame to lose it now after all that was done to save it the first time. The bridge: Built in 1905 to span a rail line along the Hudson River, this double-intersection Warren pony truss features three truss webs and a double-barreled roadway. 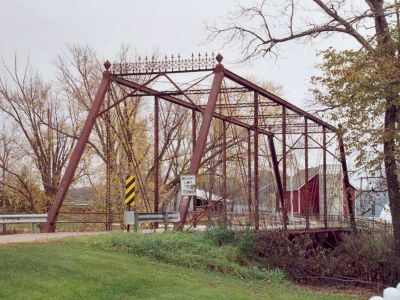 The significance: Although several double-barreled through trusses remain in use across the country, this is one of the only -- if not the only -- extant pony truss with this configuration. The situation: The weight limit was recently reduced to 3 tons, putting it on the verge of being closed entirely. Ferry Street provides one of only two entrances to the waterfront (the other is an at-grade rail crossing), so this is an important bridge. Ownership of the bridge is in the process of being transferred from CSX to Amtrak, but local officials want the city to take over the bridge and replace it, calling the project a top priority. The plan: The city has had trouble obtaining funding to replace the bridge, so they may not have any choice but to repair, instead of demolish, the bridge. The bridge: This is a five-span Camelback Pratt through truss built in the early 1950s in conjunction with the construction of Bull Shoals Lake. The significance: For reasons that are unclear, the Camelback truss design -- seemingly obsolete at the time -- was chosen for this and three other bridges built around Bull Shoals Lake. Very few other Camelback trusses were built in the country after World War II. The situation: The bridge is slated for replacement in 2017. The plan: According to a news story from February, the idea was floated at a public meeting to preserve the bridge for use as a pedestrian walkway. This could potentially be more cost effective than building a walkway on the new bridge. 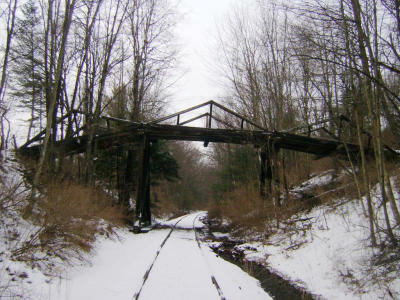 The bridge: This is an abandoned three-span timber Kingpost pony truss overpass of the Cooperstown and Charlotte Valley Railroad, operated by the Leatherstocking Railway Historical Society. The significance: It's a Kingpost. It features timber trusses. It has three spans. What more is there to like? This is an exceedingly rare -- if not unique -- bridge. The situation: The bridge is abandoned with portions of the deck missing. The plan: This spectacular structure needs some attention before it deteriorates beyond the point of no repair. A very nice list as always. I was not familiar with a couple of them.